Join forces with a former enemy and repair the devastated lands. 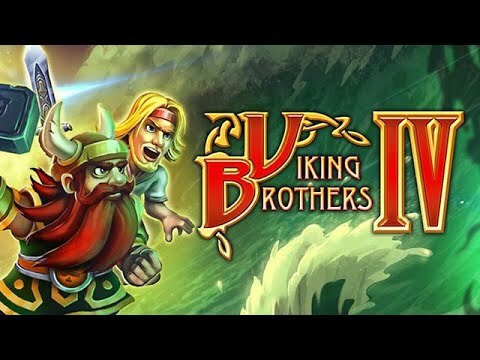 "I have enjoyed playing the three previous Viking Brothers games, and this one is also good if not better. Lovers of Time Management games will be happy with its bright and top notch play. The storyline is interesting, characters are funny and it's not too much of a clone. Looking forward to replaying again." Help the Viking Brothers hold their own as a mythological race rises from the bottom of the ocean and threatens to change their world forever. Having gained the eternal favor of the gods after defeating Loki and his evil plans, Everand and Boromere are looking forward to a well-earned retirement. But then a tsunami sweeps across the beautiful land of Midgard, devastating their home. Determined to stand strong in the face of adversity, the Viking Brothers set out to learn the cause of the massive wave and repair their land – one building, bridge, and field at a time. Before their journey is over, they'll join forces with a former enemy in a shocking twist that will change the fate of Midgard forever. Love it. I have all the other games in the series. It is very easy to play and the journey is exciting. Let's hope there is a next one. I loved this game, it did not disappoint. I have played all 4 of them and enjoyed each one. Can't wait for 5! Like all games in this series, it's good fun. A bit of easy game relaxation. Not sure about historical accuracy though!